LIVE UPDATING: Good news, now, for 3 March 2019 exam, you can check your – RSCIT Result By Name & Roll No. जिन लर्नर का एग्जाम 3 मार्च को प्रस्तावित था उनके परीक्षा की नई तिथि VMOU से प्राप्त होने पर हम आपको बतायेंगे| मार्च बैच में लर्नर अपलोड करने की अंतिम तिथि 25 तथा पेमेंट कन्फर्म करने की अंतिम तिथि 27 मार्च है| RSCIT Next Exam Date 2019: RKCL VMOU Admit Card, Answer Key: Download PDF A/B/C/D, Syllabus, Result, Passing Marks, Exam Pattern,3 March 2019 rkcl.vmou.ac.in Admission. According to the latest news, an exam which was scheduled on 17 February 2019 was postponed to 3 March 2019. Thus, on 3 March 2019, the exam has been conducted for July 2018 Batch. And, for Female Batch + Aug, Sep, Oct Batch, upcoming test date is not yet announced. Similarly, this year in 2019, RSCIT papers will be organized in series. RSCIT is a qualifying examination, which provides a certificate of basic computer knowledge to the applicants. 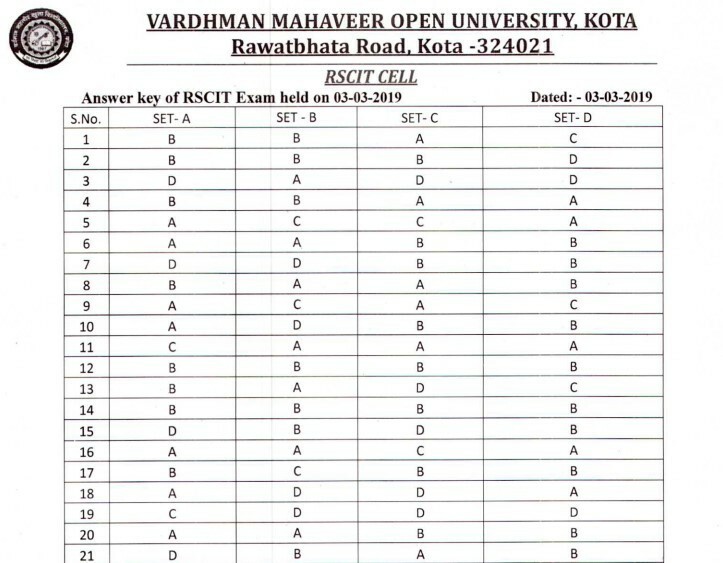 Powered by RKCL, whole examination procedure of RSCIT is managed by VMOU [Vardhaman Mahaveer Open University], Kota. And, VMOU has announced Next RSCIT 2018 Date of Exam and RSCIT Answer Key 3 March 2019 will be available on this page soon. This computer course was initially started almost five years back in 2013. Previous Written Paper Dates of this examination are 12 May 2013, 02 Jun 2013, 11 Aug 2013, 18 Aug 2013, 28 Oct 2013, 22 Dec 2013, 19 April 2014, 02 Mar 2014, 13 May 2014, 28 May 2014, 21 Sep 2014, 14 Dec 2014, 15 Feb 2015, 28 Jun 2015, 18 Oct 2015, 20 Dec 2015, 28 Feb 2016, 01 May 2016, 10 Jul 2016, 18 Sep 2016, 05 Feb 2017, 26 Feb 2017, 07 May 2017, 21 May 2017, 16 Jul 2017, 17 Sep 2017. Similarly, for the next Paper, RSCIT Admit Card 3 March 2019 will also be updated on authorised portal only like RSCIT Answer Key 23 December 2018. Although, Cut Off Marks & Merit List are totally different issues. But volunteers should regularly go through RSCIT Online Practice Test. Besides, from Ajmer, Alwar, Banswara, Baran, Barmer, Bharatpur, Bhilwara, Bikaner, Bundi, Chittaurgarh, Churu, Dausa, Dhaulpur, Dungarpur, Ganganagar, Hanumangarh, Jaipur, Jaisalmer, Jalor, Jhalawar, Jhunjhunu, Jodhpur, Karauli, Kota Nagpur, Pali, Pratapgarh, Rajasmand, Sawai Madhopur, Sikar, Sirohi, Tonk, Udaipur etc. abhi tak date nahin aayi hai. aapke exam ki date abhi tak nahin aayi hai. Respect sir, Jo log 23 december vale exam me fail ho gye the unki exam kb lagegi…..
Han, official Answer Key sahi hai. RSCIT Admit Cards will be released soon on the official website. 3 March 2019 ko jin batches ka exam hona thha unki date nahin aayi h abhi. Hello RSCIT Centre ke owner ko bolo ki complaint file karega aapki taraf se is regard or aapki RSCIT exam date ko postponed karwayega. RSCIT Next Exam will be held in next month i.e. March 2019. Exact or Expected Date of next exam is not yet announced by the board. August 2018 Batch walon ki date abhi tak nahin aayi h. Jaise hi date aayegi, hum aapko is page pe bta denge. mene june2018 me RSCIT me admission liya tha. lekin mera exam abhi tak nhi huaa h. mene jis RSCIT center m addmission liya tha wo ab band kr diya uska owner bhi nhi h na hi call lagta . mera RPSC LDC ka paper bahut achha huaa h mene alag se tying ki tayari bhi ki. lekin abhi tk RSCIT exan nhi hone ki wajah se bahut pareshan hu. pls help me. me poor family se belong krta hu. THANKS to read and understand my problem. Tumhari RSCIT Exam Date 3 March 2019 hogi probably. jab permission letter aa jayenge to download krke pta chal jayega ki exam date kya h? Kareeban hafte bhar pehle Admit Card jaari ho jayenge Suraj. Kitne marks se pass hona he. Peppar let ho rha he to marks kam karne hoge na pass karne ke liye. 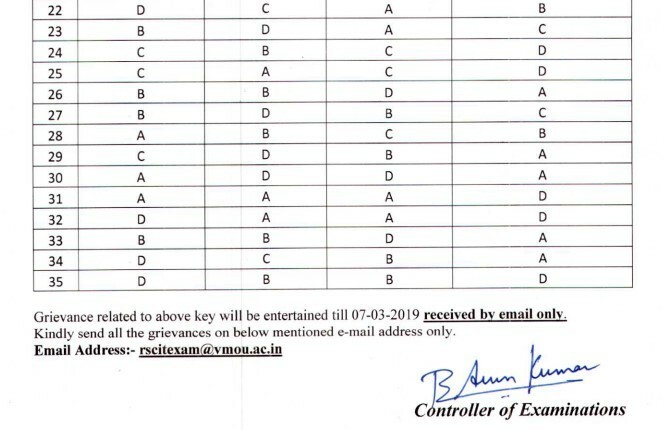 According to Rajasthan Knowledge Corporation Limited (RKCL), To qualify for main RS-CIT exam as conducted by VMOU, a Learner has to score a minimum 40% marks. Thus, passing marks is 40%. sir 23 dec2018 k exam hue fail ko vaps exam form ki date kya he or exam kab hoga. 3-4 mahine baad exam hoga. Agle form ki date janne ke liye please visit your nearby RSCIT Study Centre. sir rscit re exam kb hoga. Agli tareek 20 January 2019 ki hai. The result of RSCIT 23/12/2018 is already declared. And, the link of the same is available on this page. Please make sure to take the next Exam of RSCIT which is going to be held on 20 January 2019. Admit Card of this examination will soon be made available on this page. Stay tuned with http://www.IGNOU.guru website. Next Exam mein test de do. 20 January 2019 ko hoga agla exam. RSCIT ka next exam 20 January 2019 ko hoga. Agar abhi tk tumne exam nahin diya h to 20 January 2019 wala test do jaroor. Sir, Mera admission April 2018 ka h.
6-7 mahine ho gye lekin exam nhi kra rhe h. Iske like me Kya kru. Mera ldc ke exam ki like bahut jaruri h. Pls help me. Sir mera admission 8 may 2018 ko ho gya . October ya November wale mein. No sorry, there isn’t any such process. You will have to go through RKCL schedule only. Your test should have been organised on 2 September 2018. If you didn’t take it, you can attempt for RSCIT exam in next one. Next exam will be held probably in October 2018. Next examination in October 2018. Next examination will be held probably in October 2018. SURESH KUMAR KUMAWAT FROM KANWARASA DISTT JAIPUR SIR ME YE PUCHANA CHAHATA HUN KI RSCIT KA EXAM OCTOBER ME H BUT OCTOBER K KONSE WEEK ME HOGA TAKI ME USSI PLAN SE LEAVE SUBMTTED KR SAKU OR SATH ME YEH BHI BTANA CHAHATA HUN KI MERA LDC KA EXAM 16 SEP 2018 KA H LDC K RESULT SE PHLE TAK RSCIT KA RESULT AA JAYEGE KYA. Rscit ka next exam kb hoga. Sir mujhe admit card Download krna h kse kru mera Exam 8 July ko h.
So sir please informe me that when certificate will come ? Sir maine may 2018 me rscit ka form fill kiya tha ab exam kb hoga??? Plzz sir tell me. I filled rkcl form in november 2017. When will my exam.conduct? I filled rkcl form in november but my exam hasnt conducted. When will my exam conduct? Contact your RSCIT Centre representative for this information. Your next examination will be conducted in July itself. Yesterday RS-CIT form fill up but date missed so my form fill up June-18 month. please confirm in which month will exam and which month result declare. I applying LDC job. RSCIT Exam is generally conducted with the Gap of 90 days. Moreover, it is fixed that next Exam of RSCIT will be conducted in July 2018. Further, keeping next exam date in mind, after July test, RSCIT Exam should be conducted 80-90 days later. It will be better if you confirm your Date of Exam from your RSCIT Centre representative only. April 2018 batch exam kab hoga. Exam will be held in July 2018. Exam will be held in July 2018 last week. Next Exam of RSCIT will be in July last week. Forms are filled online, but through RSCIT Centre only. RSCIT Results are generally made available within 10 days. RSCIT 22 April 2018 Exam Result is already available. Exact Date of July 2018 Exam of RSCIT is not yet announced. Sir agar me form may me submit krta hu to mera next exam konse month me hoga ?? Your next exam will be held in July 2018. Your Test will be held in July 2018 last week. Next Exam of RSCIT will be scheduled in July 2018 last week. Your next test will be held in July last week 2018. Apply again and prepare well for RSCIT July 2018 Examination. Next Exam of RSCIT after 22 April 2018 will tentatively be in July last week. Visit Digitech Computer Centre Baran. Contact teachers over there. Ask them for the procedure of obtaining RSCIT Certificates. I FILLED RSCIT FORM 22 FEB.2018. WHAT IS THE DATE OF EXAM ? RSCIT Date of Examination for you is 22nd April 2018. December & January mein jinhone form bhre thhe, unko exam to April 2018 mein hi hona hai. Baaki apne RSCIT Centre se bhi confirm kar lo. For candidates who have filled online Application Form in January 2018 will have to take the test on 22.04.2018. Date of April will be 22nd. 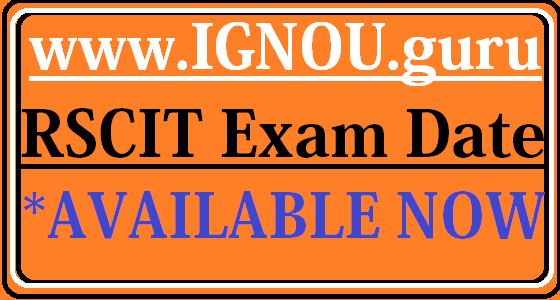 Next Exam of RSCIT will be 22/04/2018. You should’ve taken the examination on 21st January 2018. 4-5 times, RSCIT examination will be conducted throughout the year 2018. When it’s exam will be held ? For candidates who have taken Admission in August 2017, should be able to take their examinations either in 26th November 2017 or 21st January 2018. Next exam ki date nahin aayi hai abhi. Par chances hain ki April mein hogi. Probably your exam will be conducted in July 2018 Last Week.